Bread and butter, oh what a basic and simple combination, and yet, one of the heavenliest ever. 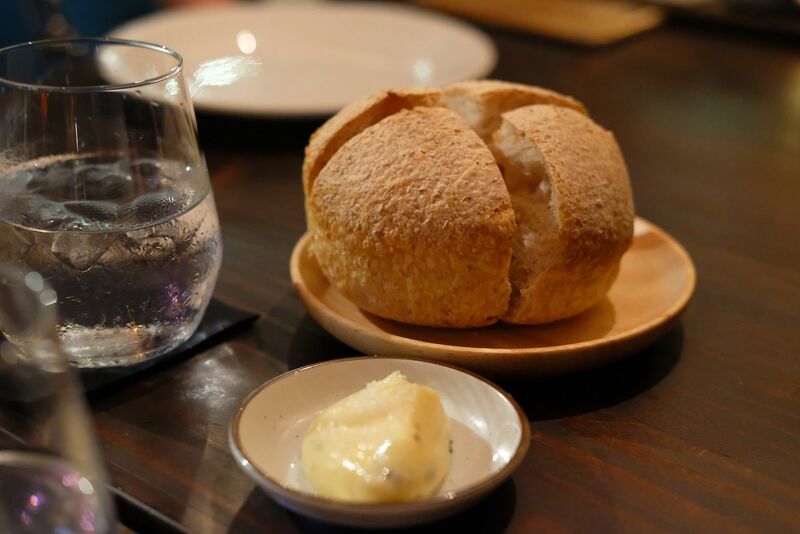 The Housemade Sourdough with Smoked Beef Fat Butter($4) is just about the perfect starter for every table. 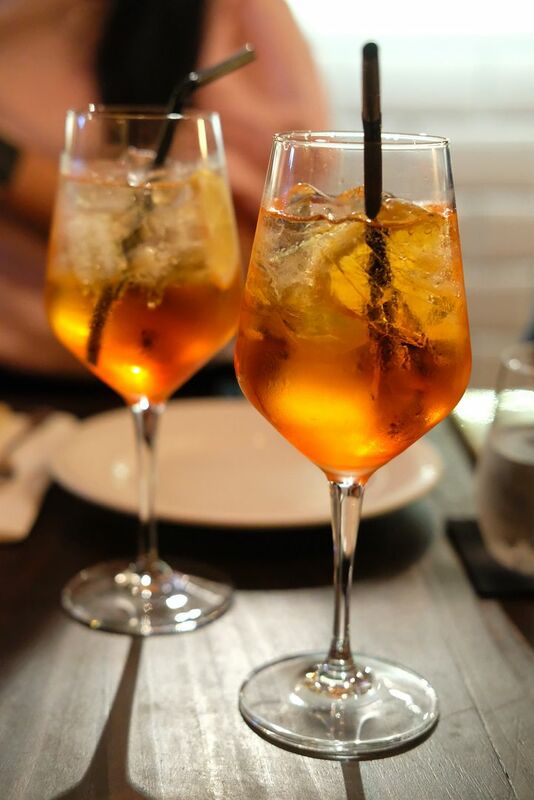 You might find it difficult to resist ordering another portion, but you really should save some space in your stomach for even bigger stars. You guys should know by now that I steer clear of vegetables, but this Shiso Tempura ($3 each) is a game-changer. Or should I say, life-changer? 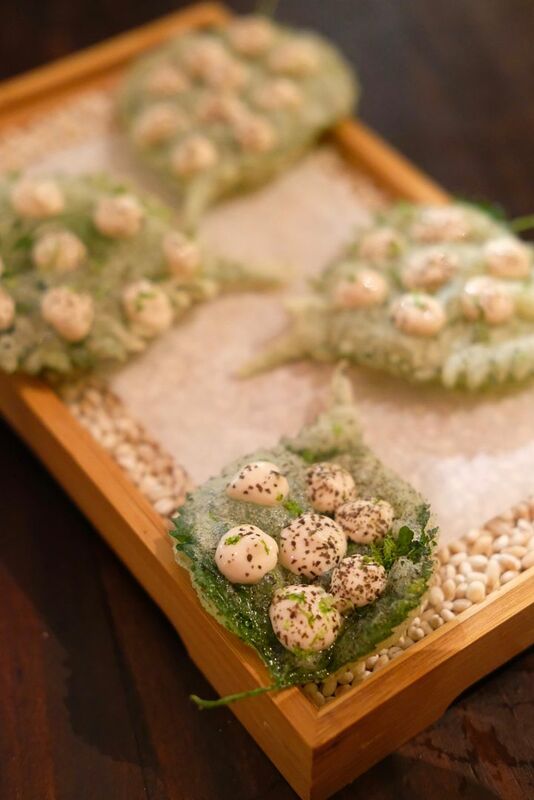 Pieces of shiso leaf are coated with tempura batter, and deep fried. Topped with blobs of taramasalata, the light and crispy leaves were extremely delicious, and crazy addictive. Never thought that I would ever say this about a vegetable dish, but this was soooo yummy. This is quite possibly the only veggie dish that I wouldn't mind eating everyday. I think most of the credit has to be given to the incredibly savoury taramasalata, which would have made any and every dish taste good! Sure, I am not a big fan of cheeses but I do love a good creamy burrata. 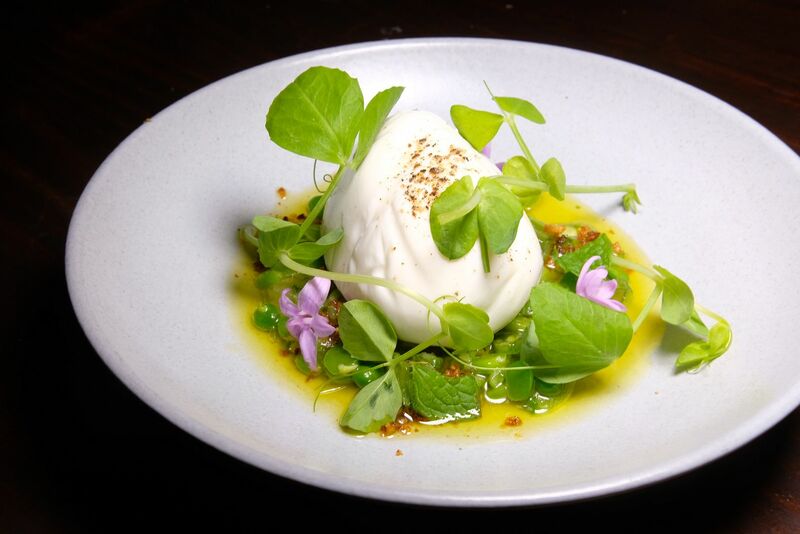 The plain-looking Italian Burratina($21) was turned into a work of art with the addition of olive oil, pea shoots, garlic flowers, garden peas and sugar snap peas. You definitely can't pass this up if you love burrata! When I was asked to pick a favourite of all the dishes that I've had at the end of the meal, I wasn't able to. Instead, I listed four dishes. And, the Hamachi Crudo($23) was one of them. 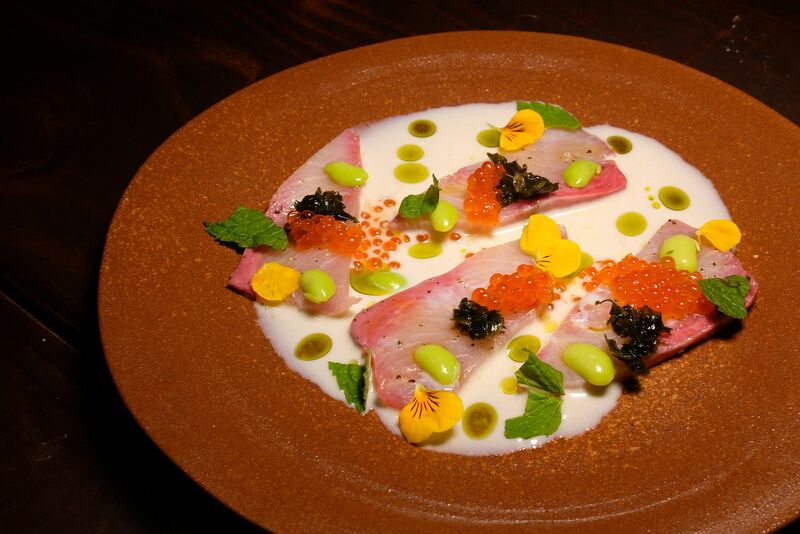 Lightly seasoned fresh Japanese hamachi, pickled wakame, ikura, trout roe and an impeccable almond sauce — perfection. I loved that the savoury notes were flawlessly complemented by the sweetness and subtle tang that the almond buttermilk sauce carried. 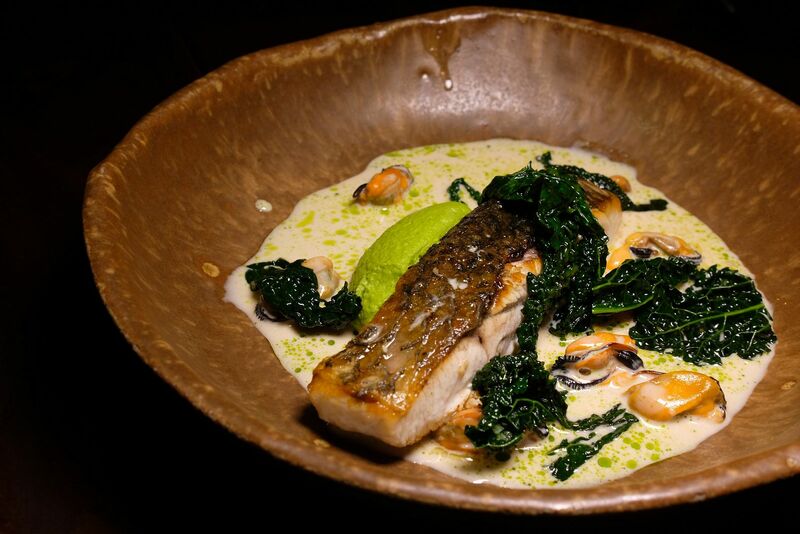 Pan-seared local Barramundi($34) sits pretty in the middle of a sea of nage, and is accompanied by Loch Fyne mussels, lightly sauteed cavelo nero, and a scoop of bright green broccoli puree. Let me start with the nage, which is a concoction of fish stock, vegetable stock, white wine, cream and many other ingredients. The nage was quite savoury but it wasn't overwhelmingly so. You can still taste the sweetness of the very well-executed barramundi which was firm and soft. 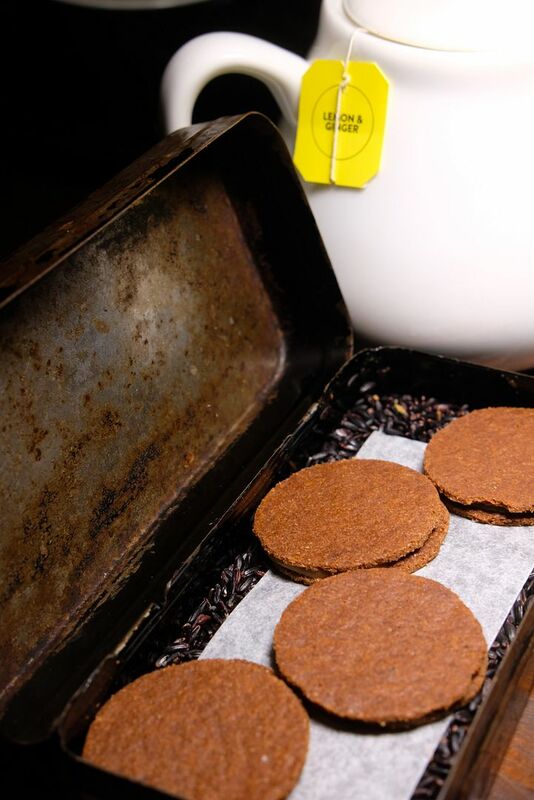 The thin crispy skin was just the icing on the cake! The mussels were slightly briny, and sweet, and quite a heavenly combination with the nage. What a marvelous ensemble! And here's number 2 of my top 4. The Duroc Pork Chop($42) was a total winner and an absolute stunner. Well, for me at least. 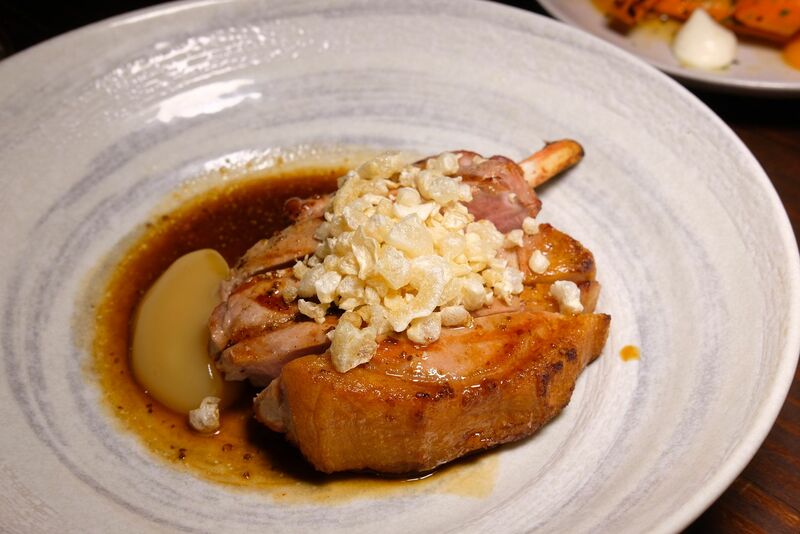 I love pork chop with apple puree, so you can imagine how much I enjoyed this thick slab of tender and flavourful meat! I was watching intently as my dining partner cut through the meat with ease, and I couldn't help but crack a smile because I knew that this was gonna be good. Cooked in an INKA charcoal oven, the pork was blessed with a hint of smokiness, and just the slightest char. The thickness of the pork chop might give the impression that the meat is going to tough, but you'll be surprised by how juicy and tender it is. I really loved it so much and this has gotta be one of, if not the best, pork chops I've tasted this year! Can you guess that this made it to my top 4 too? 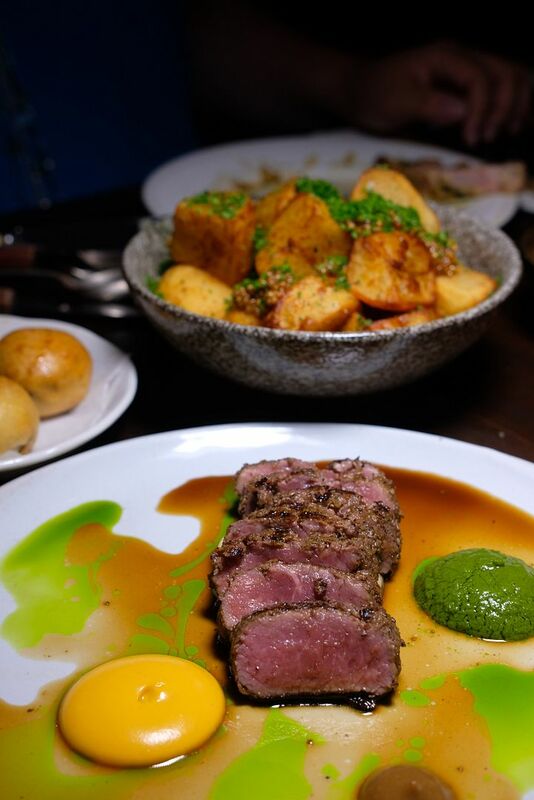 Rubbed with a unique spice mix, the Australian Lamb Loin($44) rocks a gorgeous pink centre, and rests pretty in a shallow pool of lamb sauce which had been simmered with lamb bones and other aromatics for hours. I was surprised that the lamb did not reek too heavily of that distinct lamb taste. And I was even more surprised that I not only took a bite of it, but finished an entire piece. I thought that Chef Seumas did a really good job mellowing out the harsh and sharp taste of the lamb. The lamb was also very tasty. 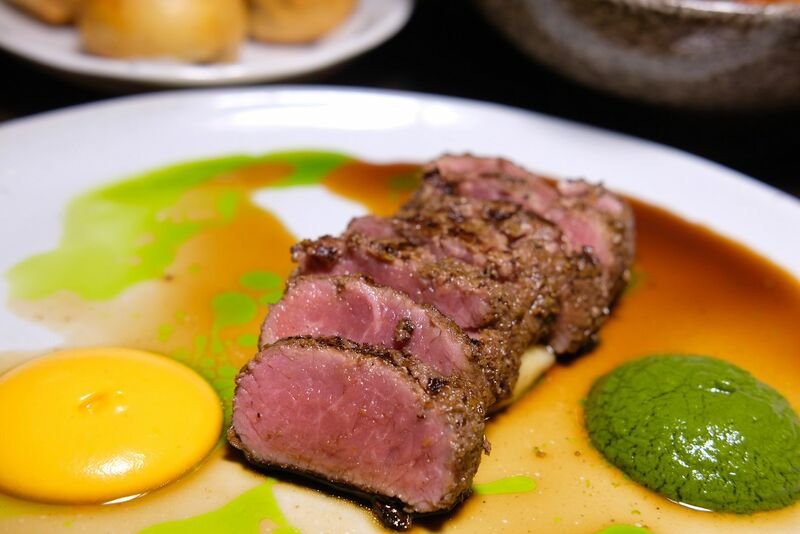 Have a bit of everything(salsa verde, nutmeg mash, black garlic, salmorejo, and lamb of course) in a bite and enjoy the symphony of flavours. The dish is accompanied by 2 mini braised lamb buns that are crafted with confit lamb belly and braised lamb shoulder. While most of my dining partners enjoyed the buns immensely, they were too "lamby" for me. 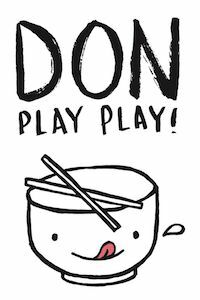 Oh, and don't forget to get a big bowl Fried Potatoes($10) to share! Duck is probably not the first option that you'll consider when you're looking through a menu. Most of us always go for beef, or lamb, or maybe chicken. 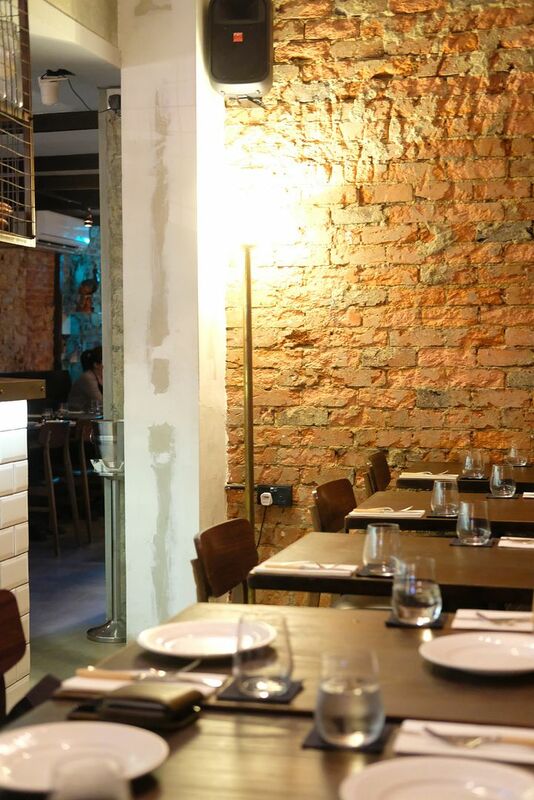 Well, at Maggie Joan's, the Duck Breast($36) is disarmingly delicious. I am a huge fan of duck but even so, I don't pick duck as my main course ever. But I'll pick this dish again, and again, in a heartbeat. 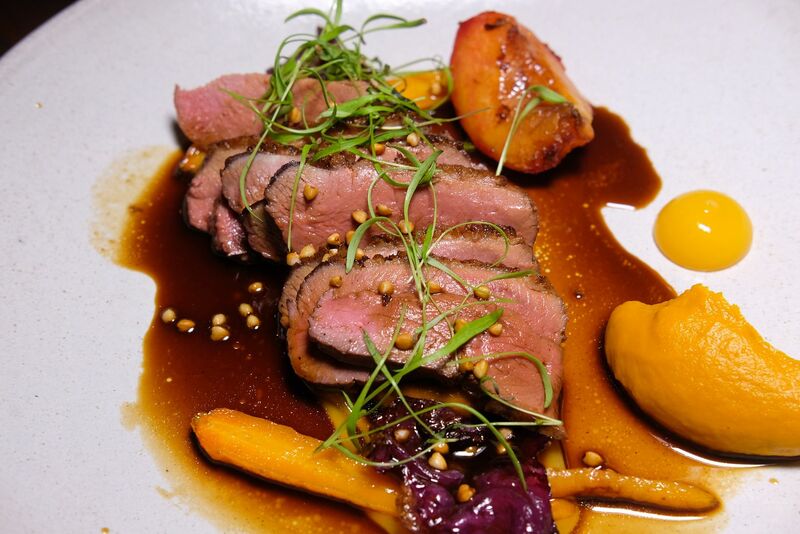 More than just a visual treat, the beautifully-plated dish sees duck from France go through a multi-step cooking process, before it is completed with carrot puree, roasted baby carrots, plum puree, red cabbage and duck jus. I'm not sure if you like the unmistakable taste of duck, but I love it, and I love that it was very distinct in the duck breast. While the other ingredients served to accentuate or complement the flavours of the duck, be it in terms of adding a dose of sweetness or touch of acidity, they didn't matter to me. 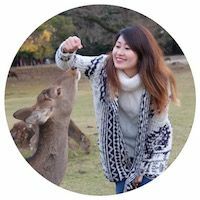 I was eating the entire slice of duck on its own, savouring and relishing every bite, taking in the juices that oozed out. And this, ladies and gentlemen, is the fourth and last of my favourite dishes that evening. 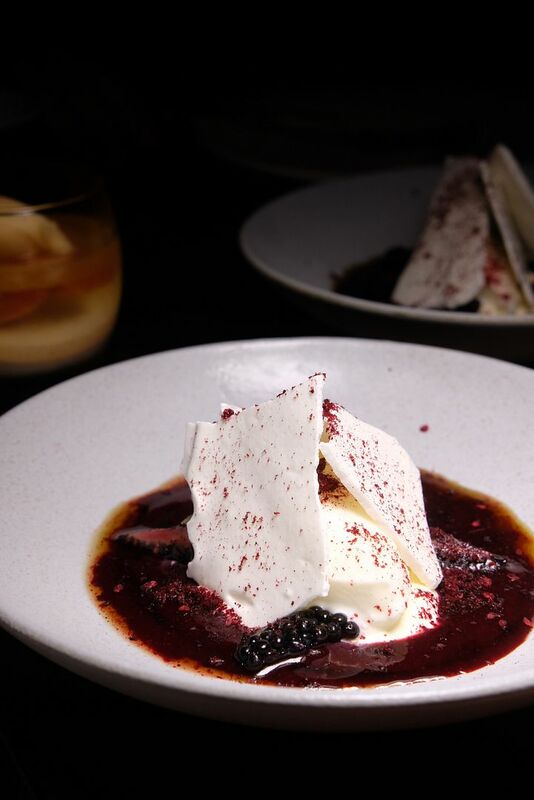 After a really filling dinner, we dug into 2 fruity desserts — Yogurt Sorbet with Blackberries and Shiso ($12) and Coconut Panna Cotta with Prosecco and Grapefruit($12). The desserts weren't really my thing because I don't like yogurt, and blackberries. And I thought that the panna cotta with grapefruit was a little too acidic for me. Maggie Joan's really exceeded expectations. They turned ingredients such as pork and duck, which aren't the most popular choices at a dining table usually, into huge stars. I'll definitely, definitely be back for my top 4, and the sourdough, of course!